Love him or loath him, Tim Tebow is the Man of the Year in the NFL. With every dramatic finish, more fans are becoming believers in the polarizing Broncos quarterback. And while a Tim Tebow card collection is one way to show your devotion, Tim Tebow shirts are a much more practical option. eBay has tons for both the Tebow lovers and the ironic hipster haters. The huge majority of Tim Tebow shirts offered aren't licensed or even affiliated with the former Florida Gator, but they're still a fun way to get in on Tebow-mania. Like a lot of shirts, sometimes stranger is better. 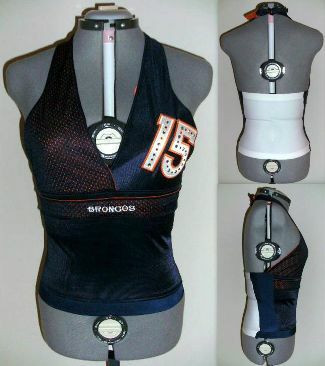 Here are ten of the weirdest Tim Tebow shirts listed on eBay. Most are available in both men's and women's sizes. 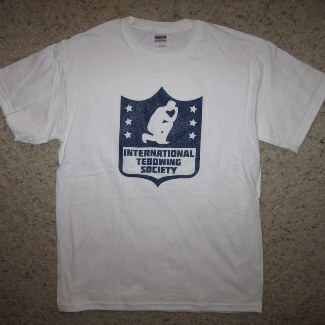 Mixing the NFL shield with a silhouetted figure Tebowing, this shirt riffs on the quarterback's iconic ritual. 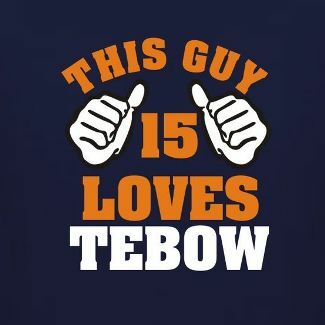 Although the reference is clear, this Tim Tebow shirt has a subtle feel to it. Tebow's 316 yards had fans keeping the faith after the Broncos' dramatic wild card win over the Steelers. John 3:16 is one of the most quoted scriptures in the Bible. Austin 3:16 was one of the hottest selling wrestling shirts back in the WWE's attitude era. 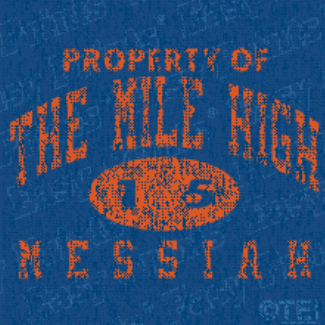 Mash it all up and you've got one simple but iconic Tim Tebow shirt. 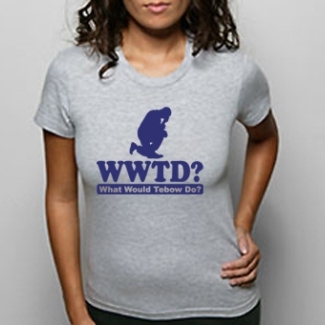 This Tim Tebow shirt requires a little thought. Without an image or specific reference to the quarterback, it's a puzzle that might lead to puzzled people asking you what a T-bowtie is. 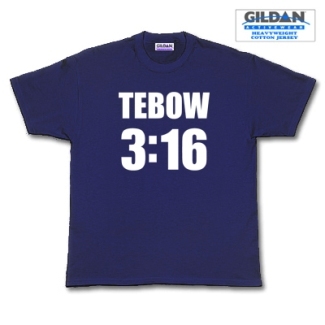 Like a lot of Tim Tebow shirts, this one takes on the quarterback's Christian faith. The WWTD? slogan is a take on the long-used WWJD? (What Would Jesus Do?) saying that dominated the novelty bracelet market before Lance Armstrong came along. One of the Christian quarterback's many nicknames, this Tim Tebow shirt takes a classic design and gives it a modern spin. The familiar look and lack of graphic make it a somewhat subtle option. 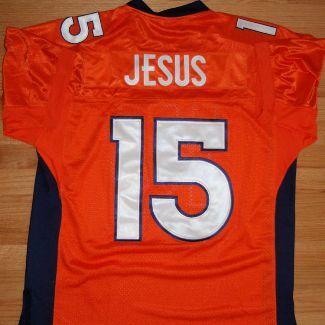 Who knew Jesus was a member of the Broncos? Although this jersey may take it a little too far for some, others are bound to get a kick out of it. Strictly for the ladies, this shirt is sure to draw some looks. Just understand they're not going to come just from Tim Tebow. The added bling only adds to the class. 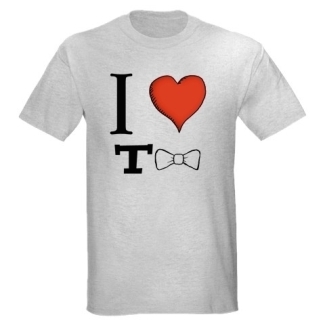 If you want to make a big and bold statement, this is the Tim Tebow shirt for you. The mix of bright Broncos colors, clear text and thick-lined thumbs will make anyone stand out. Acknowledging the polarizing appeal of the young star, this shirt brings back another over-used slogan and gives it a little Tebowing flair. 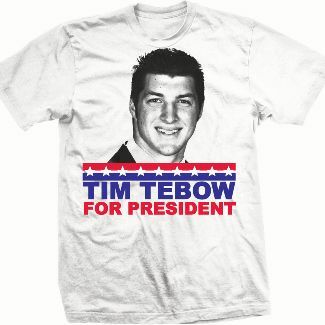 With all the Tim Tebow items that are available, some might be able to claim that he's helping turn the economy around. It's an election year. Why not? This is definitely one of the brightest Tim Tebow shirts available. 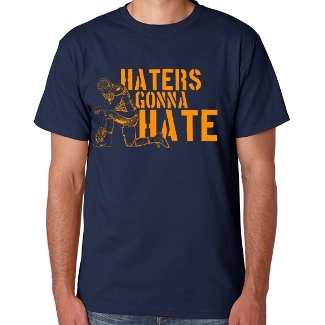 Love them….might buy the Haters gonna hate one.